Some of you might know that I went on a trip to explore some of interior Alaska last week, and I have returned with photographic riches! We were able to view the aurora two different times, but the second night was the best by far. The weather cooperated enough to allow us some awesome views of the Northern Lights, a nice pause in the wind and rain that we’d been dealing with all week. In case you don’t already know, the aurora is caused by solar wind (which is made up of charged particles that are emitted from the Sun’s outer atmosphere) interacting with the Earth’s magnetosphere. The particles within the atmosphere are excited and release energy in the form of light, and the color of light depends on the composition of the particles giving up energy. 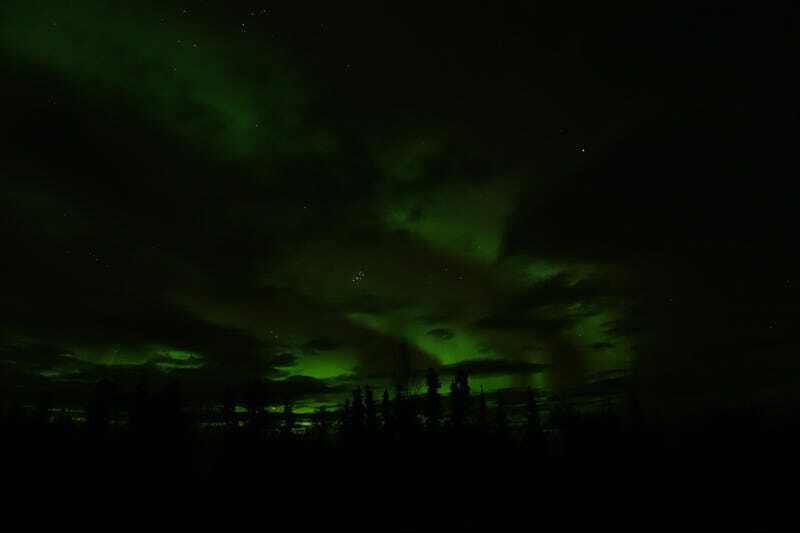 The green lights are most common, both because the human eye is able to detect green more than the other colors and because molecular oxygen produces this green color when hit by solar wind. At the highest altitudes, the molecular oxygen can produce red or magenta light. These aurora curtains were right in front of Ursa Major. The really cool thing about the aurora is that it happens simultaneously at both poles. So while we were looking at aurora borealis in the North, aurora australis was happening at exactly the same time in the South. All of the above images were taken with my Sony RX100. I didn’t fiddle with the settings too much because I was busy snapping as many pictures as possible while the lights were still there - they weren’t moving so quickly to the naked eye, but they can disappear at any time. ISO 1600 and 3200, 4 to 6 second exposures, f/2.8 to f/5. More Alaska pictures to follow later in the week! UPDATE: I added a slideshow that shows a little bit of the aurora movement. Some of the changes are from me adjusting the settings and the camera direction, but there are a few moments where you can see the way the aurora moves.